show that a growing number of grantees are looking to agencies and other third parties for help developing, managing and optimizing AdWords accounts and online marketing campaigns. However, this number is still pretty small and we’ve heard from many more of you that you could use help with marketing projects from time to time but don’t really have the resources to handle it. Media Cause is a new online resource that connects NGOs and online marketing volunteers to collaborate on Google Grants, SEO, and social media marketing projects. NGOs can sign up for free, post online marketing “challenges” (anything from improving a Facebook profile page to optimizing an AdWords keyword list) and have an expert from the online marketing world step in and lend a hand. But wait, there’s more! Media Cause volunteers get something out of it, too. By contributing to your organization and others, they gain valuable industry experience that Media Cause helps them parlay into career advancement for individuals and exposure for agencies. Through social media and website promotion, internship and training opportunities, and job placement assistance they do their best to return the favor to the online marketers who participate. If you’re looking for expert help with your organization’s online marketing, check out Mediacause.org and post a challenge for their industry experts. Our recent benchmark reports show that a growing number of grantees are looking to agencies and other third parties for help developing, managing and optimizing AdWords accounts and online marketing campaigns. showing the threats to the tigers’ habitat. WWF estimates that only 400 Sumatran tigers remain today. 12 of these tigers and two mothers with cubs were recorded in WWF’s camera traps over a period of 2 months. Along with elephants, rhinos and orangutans, these tigers live in lowland rainforests of Sumatra called Bukit Tigapuluh that is presently being logged by Asia Pacific Resources International Limited (APRIL) and Asia Pulp and Paper (APP). Learn more from Mongabay, read the original WWF press release and watch full video footage of the cubs, and find out how you can help save Sumatra. To learn how to create a Google Earth narrated tour to tell your own story, watch this Google Earth Outreach video tutorial. These Sumatran tiger cubs have been caught on WWF’s motion-triggered video cameras playing with a large dry leaf and frolicking in the Sumatran rainforests. WWF released the footage last week, along with a Google Earth tour by David Tryse showing the threats to the tigers’ habitat. WWF estimates that only 400 Sumatran tigers remain today. 12 of these tigers and two mothers with cubs were recorded in WWF’s camera traps over a period of 2 months. Along with elephants, rhinos and orangutans, these tigers live in lowland rainforests of Sumatra called Bukit Tigapuluh that is presently being logged by Asia Pacific Resources International Limited (APRIL) and Asia Pulp and Paper (APP). Learn more from Mongabay, read the original WWF press release and watch full video footage of the cubs, and find out how you can help save Sumatra. 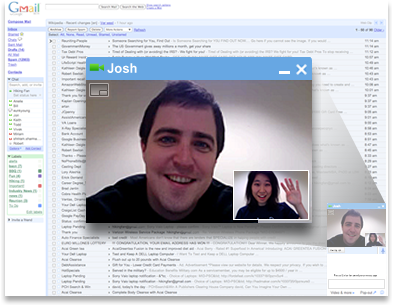 Over the last few weeks, we made improvements to instant messaging, increased capacity for saved contacts, added powerful data analysis with pivot tables in spreadsheets and introduced more flexible management tools for Google Apps customers. In the last three weeks, we’ve seen more than 60,000 organizations choose our cloud products for their communication and collaboration needs, and this week a couple international customers stood out from the crowd. Oxygen Design Agency based in Toronto, Canada chose Google Apps and avoided a big investment in traditional email servers when their previous email solution started to break down. With Google Apps, their downtime woes have disappeared, designers can stay in contact when they’re meeting clients and the system is much simpler and more affordable to manage. EAT. has more than 100 restaurant locations and 1,700 employees in the U.K. They serve fresh, healthy food—as well as kilobytes to customers through technology programs like an iPhone ordering app, free in-store Wi-Fi, a Twitter feed and a tap-to-pay system. EAT. selected Google Apps to replace their old system to get away from complex, costly upgrades, achieve hassle-free scalability as their business expands and securely support a wider array of mobile devices. (RHoK), bringing together subject matter experts and volunteer software developers and designers to create open source software solutions that address challenges facing humanity. The weekend of June 4-5, 2011 we’ll hold the next round of 18 Random Hacks of Kindness global events at five US and 13 international sites, giving the community opportunities to collaborate in person, sprint on projects, and engage in new work together. We’re looking to non-profit organizations and experts in the fields of Disaster Risk Management and Climate change to submit problem definitions online, letting hackers and volunteers know exactly what problems need to be solved, and the context the technology must work in. You can also attend events to meet with developers in person and get them excited about specific projects. Applications developed by the RHoK community in the past include: I’m OK, a mobile messaging application for disaster response that was used on the ground in Haiti and Chile; Person Finder, a tool created by Google to help people find friends and loved ones after a natural disaster, refined at successive RHoK events and effectively deployed in Haiti, Chile and Japan; and CHASM, a visual tool to map landslide risk currently being piloted by the World Bank in landslide affected areas in the Caribbean. If you’re in Silicon Valley and would like to do a brief introductory presentation on your problem at the Google Mountain View campus let us know. Visit http://www.rhok.org/ for more information and to sign up for your local event. For the last two years Google has partnered with Microsoft, Yahoo!, HP, NASA and the World Bank on Random Hacks of Kindness (RHoK), bringing together subject matter experts and volunteer software developers and designers to create open source software solutions that address challenges facing humanity. The weekend of June 4-5, 2011 we’ll hold the next round of 18 Random Hacks of Kindness global events at five US and 13 international sites, giving the community opportunities to collaborate in person, sprint on projects, and engage in new work together. is free for qualifying organizations with fewer than 3,000 employees, and offered at a 40% Business discount for nonprofits with more than 3,000 employees. Google Apps for Nonprofits is a great way to improve your productivity, while also significantly cutting costs. Hardware and software can be expensive, especially when you consider additional email servers, spam protection, word processing, spreadsheet and presentation applications. These multiplying costs can cannibalize your ability to deliver your dollars toward fulfilling the core mission of your organization. You can actually estimate a calculation of the savings your organization could deliver by switching to Google Apps here. (And note that you can subtract out the "Google Apps for Business licenses" costs if your nonprofit has less than 3,000 employees). Using Docs, you can easily create and share documents, spreadsheets, and presentations without managing messy and confusing attachments. Collaborate with ease by editing files simultaneously and try the forms feature within Google Spreadsheets to quickly collect data and even embed the form on your website. Don't know HTML, but don’t want to wait for your webmaster to make an update to your website? Empower your employees to create content quickly and easily using Google Sites. With Sites you can created internal or external websites to manage projects, host content or create a central portal for your organization. These are just a few of the tools included in Google Apps for Nonprofits. To learn more, visit this site. We support and encourage the great work you do, and we'd love to hear how you're using Google Apps to drive your nonprofit's mission. 1. Start today by creating a (free) Google Apps account for your domain. * The Google for Nonprofits program is currently available to U.S. 501(c)(3) organizations. We plan to roll out the program internationally later this year. Thanks for your patience! Every day, many nonprofits choose Google Apps to host email, collaborate in real-time on documents, and coordinate schedules - to name just a few features. Better yet, Google Apps for Nonprofits is free for qualifying organizations with fewer than 3,000 employees, and offered at a 40% Business discount for nonprofits with more than 3,000 employees. In the last couple of weeks, we’ve helped you personalize Gmail in new ways, made our applications speedier to use, brought text recognition and editing powers to Android phones, and given you a glimpse into the inner workings of a Google data center. 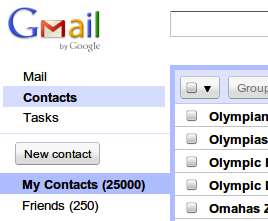 For a long while, Gmail has had themes so your inbox can reflect a bit of your personality. Now, you can set Gmail’s background to a photo from your computer or Picasa Web Albums. 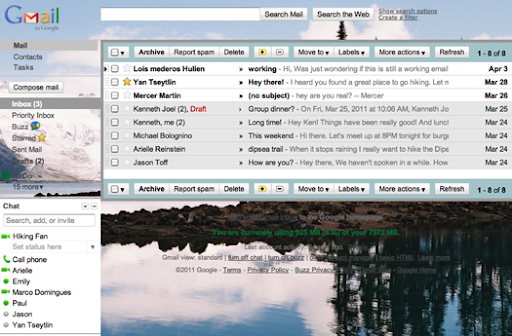 So if Gmail’s standard theme choices don’t quite float your boat, now we’re sure you can create a theme you’ll love. Features like nearly-instant search and integrated instant messaging help you save time in your inbox, but we’re always looking for new ways to speed up your experience in Gmail. On Monday we released a new feature in Labs called Background Send that can shave off a few seconds each time you hit “Send.” With this feature enabled, you can start working with other messages while your outgoing message is processed in the background without slowing you down. Give it a try from the Labs tab of Gmail Settings. 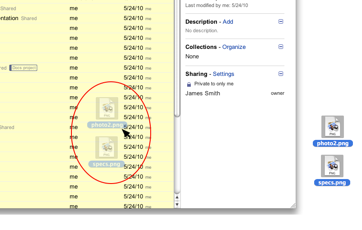 On Monday, we sped up the Google Docs experience with improvements to file uploads. Now you can upload a whole folder at once, and if you use Chrome, Safari or Firefox, you can even drag and drop files from your desktop into the documents list or specific collections. You'll also see an upload progress window right in the documents list. 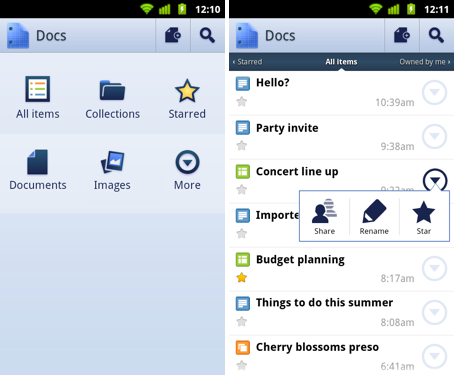 Thanks to a brand new Google Docs app for Android, it’s easier to browse, search, edit and share your documents right from your mobile phone. You can even create new documents by snapping a picture of text with your phone’s camera, and thanks to Google Docs’ optical character recognition (OCR) capabilities, words in the image are converted to text that you can continue editing from your phone or computer. 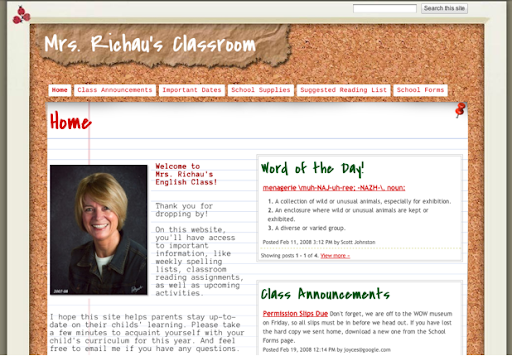 With more design choices in Google Sites, you can create better looking sites that match the look and feel you want to achieve. This Wednesday, we added 100 new fonts to the text formatting options in Google Sites, so it’s easier to make more personalized pages for your organization, project, classroom or business. A hearty welcome goes out to over 50,000 businesses, schools and organizations that have switched to Google Apps in the last two weeks. Several have shared their stories on the Google Enterprise Blog, so you can learn about how Cinram has improved communication and collaboration across 20 manufacturing facilities in North America and Europe, how Gibson Sotheby's International Realty is empowering hundreds of mobile workers like never before, and how the states of Rhode Island and Missouri are making Google Apps available to more than a million students and 100,000 staff members. Over the years, the Google Earth Outreach team has seen hundreds of maps that nonprofits are using to change the world for the better. We’ve also talked to just as many nonprofits who have a great idea for a map they want to create, but don’t have people on their team with enough technical skills to create it. Today, we’re excited to announce the Google Earth Outreach Developer Grants program, supporting selected projects from eligible nonprofit organizations that are using Google’s mapping technologies in novel, innovative ways to make the world a better place. Through this program, non-profit organizations from all over the world will have an opportunity to receive up to $20,000 that will help turn their mapping ideas to support their causes into a reality. Numerous nonprofits have already used Google Earth to raise awareness about an issue or cause that demonstrate innovation and creativity. The US Holocaust Memorial Museum and partners created the Crisis in Darfur Google Earth layer, which utilized Google Earth’s high-resolution satellite imagery to document the burning of villages, destruction of communities and livelihoods as a result of the genocide in Sudan. The presentation of refugee stories and testimonials in a map visualization brought 26 times the usual number of visitors to the USHMM’s “How Can I Help?” section of the website. 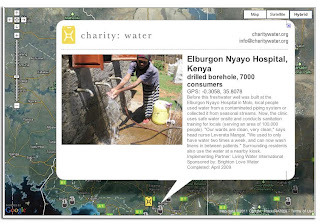 Charity:Water uses the Google Maps API to show donors precisely where the money they contributed was allocated. After donating, donors receive geographic coordinates to view the location of a well to which they’ve contributed, and they can also view pictures of people accessing clean drinking water as a result of their contribution. Photo Caption: Charity:Water connects donors to well sites all over the globe. Applications to the Google Earth Outreach Developer Grants program will be accepted until May 26, 2011. More details of the program, project requirements and eligibility can be found on the Google Earth Outreach Developer Grants page. Apply today!